This radiant white and green variety looks fabulous in the shade when planted with the Athyrium 'Frizelliae' ferns. The foliage is very eye-catching on both and they really illuminate the shady spots. Astrantia major 'Star of Billion' promises to twinkle in the garden! Its white and green flowers, surrounded by bracts that look like an Elizabethan collar, are set above lovely, lacy foliage. The long-lasting flowers actually look like they hold countless pins in a pin cushion. 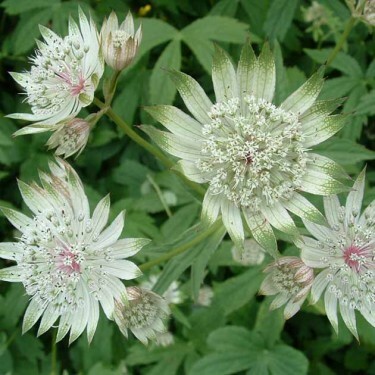 Astrantia prefers shade or partial shade and will grow in most garden soils. With good growing conditions the plants may form large clumps. Adored by florists, Astrantia makes an outstanding cut flower with a vase life of at least 10-14 days. Watch the Botanus Garden Club video about 'White Gardens' including Astrantia major 'Star of Billion'!